Overview of selecting and adding pages to your website. Pages are central to your website and are where nearly all website content is found by your visitors. Each page has a chosen "type," that gives it a unique purpose. We have over 20 different page types tailored for things like uploading documents, posting photos, displaying events on a calendar, and more. When building your website, the most important part of the process is choosing which pages you're going to add, creating them, and then filling them in with valuable content. This part isn't too difficult, but may require a bit of planning. To get an idea of the different types of pages you can add to your website, it may help to first see which page types are available. To do that, visit the "Pages" section of the Admin Control Panel and click the "Add new page" button. There, you will find a list of all available page types to select from. Some of our most popular page types include the calendar, board members, documents, committees, photo gallery, and news articles page types. There's certainly no need to add every type of page right away as you can always add more later! Therefore, we recommend starting with a small set of about 5-10 pages that display the most important content for your members. Navigate to the "Pages" section of the Admin Control Panel and click "Add new page" to get started. When naming each page, choose short and descriptive names. Avoid using your community's name or acronym in the page name, and avoid numbering the pages (in case you reorganize them later). If you're having trouble coming up with a page name, it's important to note that you can always rename a page later! Now here comes the fun part—adding useful content to each new page! The process for doing so varies by type, but you'll always want to look for the blue buttons on each page that indicate administrative functions. On a "Documents" page type, adding new files is as easy as clicking the blue "Upload new documents" button, selecting the files you want to upload, and clicking the "Upload" button. Other page types are similarly easy! For calendar pages you'll want to add events, for photo galleries you'll want to upload photos, etc. Our interface has been designed to make this an intuitive process. Keep going until there are no empty pages left. 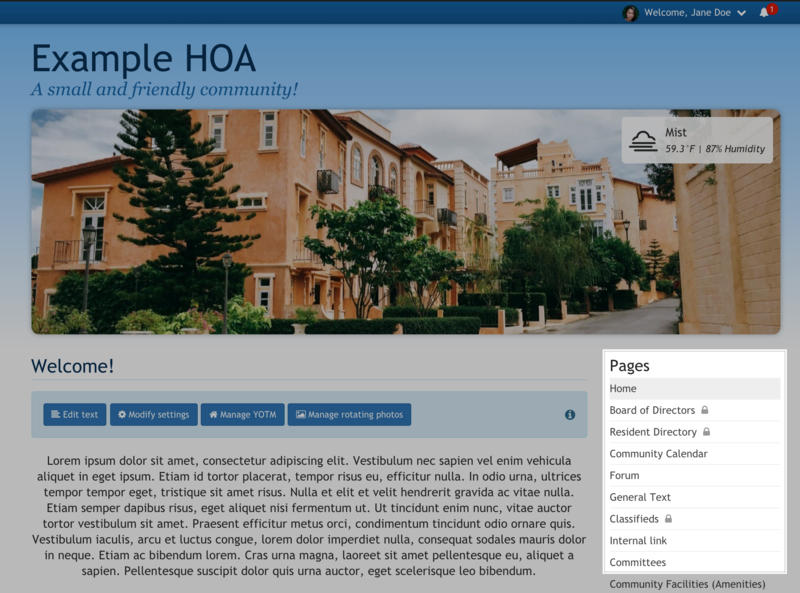 The pages that you add will be visible in the page menu when members visit your website. If you'd like to make changes to the order of your new pages or the page titles, re-visit the "Pages" section of the Admin Control Panel.